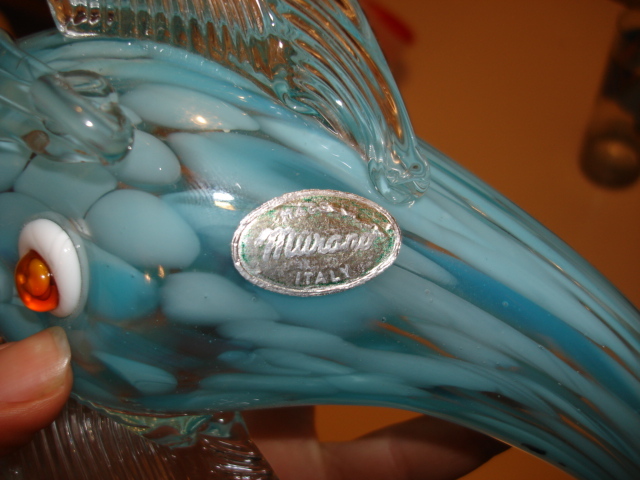 Hi Cathy, Any chance you could add pics of your labels into the Murano 101 album on GlassGallery please? Hi Anne, I added the label but don't see in on the 05 Murano 101 Labels pages. Did I do something wrong? I see it on the Album list. 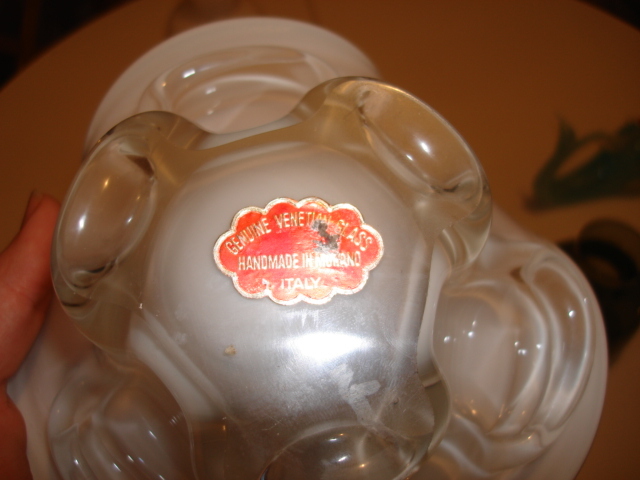 Hi Cathy, I always thought that the "Genuine Venetian Glass" labels were recent. 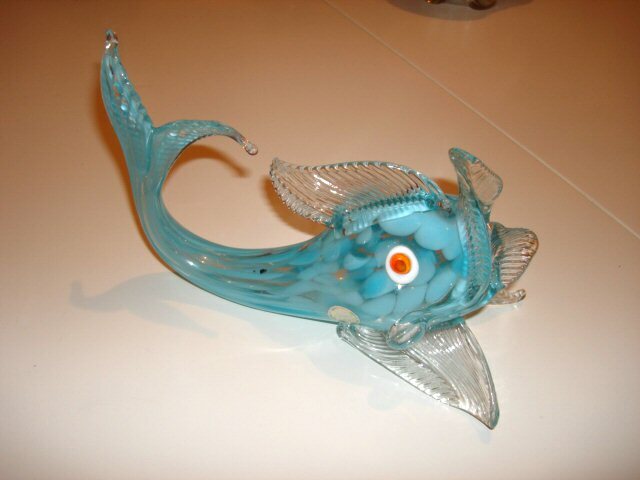 Here's another variation of it, the difference being that it has "Hand Made In Murano" in the centre. Hi Bubbles, I think I have the same label on this fish. Thanks Cathy, I love it too! I just need to get a better image of it, and also one under under fluorescent light to show the blue colour. Also took a look at your site, yum, I just wish I could win the lottery! Hi Tigerchips, yes it certainly looks the same label although yours looks more silver than gold, but it is probably the light difference. I wonder when these labels were in use? Thanks for moving the picture of the whole vase from the label album, I'll get the hang of it soon I promise! The fish label is silver but I think the original colour was green. Tigerchips...I did look up the history of S.S. Kresge Co. and I found it changed it's name in 1977 to K-mart. So at least I know that much. I guess the vase could have been sold at anytime up to 1977. Bubbles...Thanks for your reply on the website it's nice to hear. Anne...I do see it! 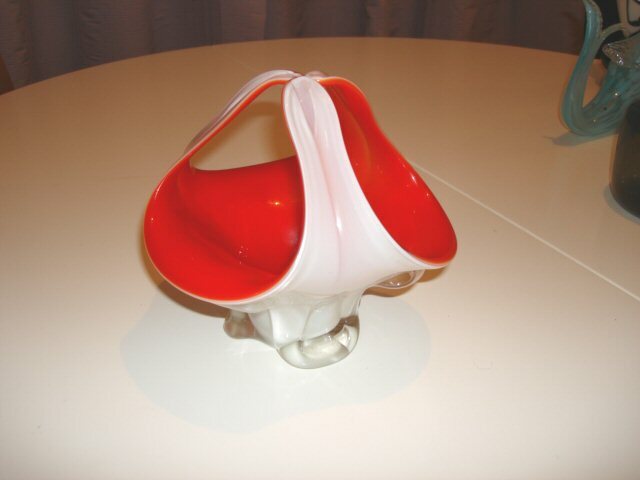 Thanks...Maybe I should change the caption under the label since the vase could have been sold in the 70's too. How do I change what's under the picture? Do I just delete it and upload it again? And if so how? You should see an edit description button under the image Cathy? If you don't see that then you could e-mail me the new text and I can edit it for you. 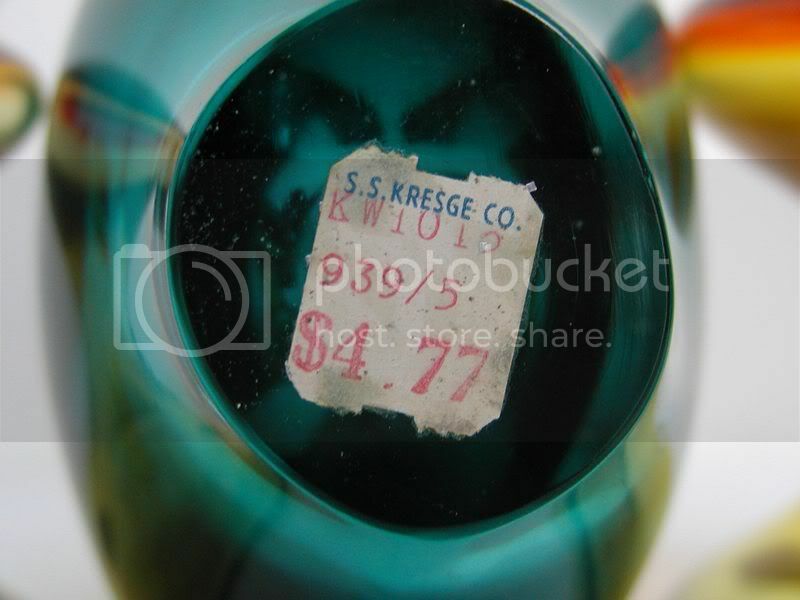 If you can locate a former Kresge stock clerk, I have no doubt they will be able to tell you instantly what year that Murano vase was put on sale and the price paid by Kresge. The information is all on the sticker, but in a simple commercial code. J,J,Newberry, my employer c. 1960, used the words "Palmer John" in which p =1, a=2, etc., and x designated repeat. (The sum of $11.49 translating to PXMN.) When used with the prefix 3 and the suffix 1 or 61, as in 3PXMN61, you could tell the item went on sale in March of 1961, at a cost of $11.49 each, or per dozen for lower priced items. Thanks for the info, but I still can't make heads or tails out of it. It doesn't seem to me, to follow that explanation. Maybe the KW for someone's initials but the rest...I'm not getting. I'm adding a close up of the sticker. Page created in 1.062 seconds with 28 queries.